The Cyber Physiology: SimBioSys™ (Simulations of Biological Systems)software environment are a group of numerical simulation programs that model the heart, circulation, lungs and kidneys in coordination. The SimBioSys™ software packages simulate the physiological functions of the human body, allowing health professionals to practice their skills on a realistic patient. 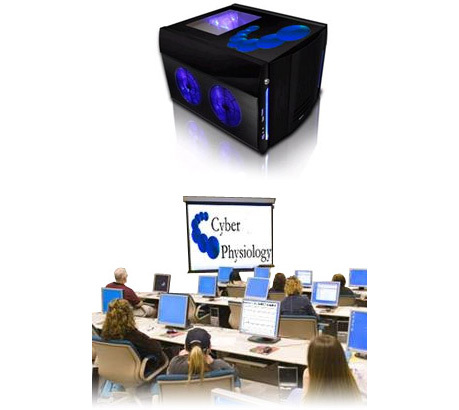 Cyber Physiology Programs are delivered on a specialized computational platform that enables the fast real-time computing and solving of over 200 differential equations with over 1000 physiological variables. The student learns by experimenting with a simulated, living patient. The student can model blood loss, give a host of drugs or fluids, or use clinical tools (such as pacemaker or a mechanical ventilator). The screen can be set up to display a variety of different graphs or outputs and the user can change the properties of the human body directly. Through experimentation the students learn to control clinically unavailable parameters such as cardiac contractility, lung inflation, and glomerular filtration. Instructors can use ready-made exercises or can easily create their own. Labs allows the user to perform standard clinical tests and interventions. By continuously calculating a series of differential and algebraic equations, mathematical models of the coupled heart, lungs, circulation, kidneys and peripheral tissues are computed in real-time. Physiology students can simulate experiments as well as learn about the effects of standard medical interventions. Many variables in each system can be adjusted from normal values, allowing the user to manipulate these systems and watch the effects in real-time on a computer screen. There is a more extensive version of this program entitled SimBioSys Physiology Labs Plus, a program for teachers who wants to incorporate simulations into their teaching, and for the physiologist who wants to study responses to interventions in a modeled system. The SimBioSys™ (Simulations of Biological Systems) software packages are a group of numerical simulation programs that model the heart, lungs and kidneys in coordination. These organ models are coupled to a vascular system and a simplified central nervous system. Mathematical models of the coupled heart, lungs, circulation, kidneys, and peripheral tissues are computed in real time by continuously calculating a series of differential and algebraic equations. The SimBioSys Physiology Labs program contains a textbook and sixty-eight guided laboratory exercises for students to experiment with a simulated living, breathing patient. The program teaches and simulates important concepts in the cardiac, cardiovascular, respiratory, and renal systems, as well as some general physiology. It runs on the same core mathematical engine used by the five other products in the SimBioSys series. The parameters and variables that are not directly used in the laboratory exercises can be used in a tool called "Viewers." 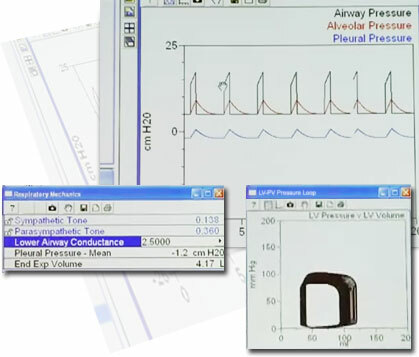 With the Viewers, users can independently experiment with the variable physiologic parameters, model blood loss, administer drugs or fluids, and use clinical tools such as a pacemaker or mechanical ventilator. Course instructors can also use the Viewers to create and save custom exercises to be used for teaching purposes. Numerical panels display simulation parameters as numerical values. Figure 1 shows two examples of numeric panels. 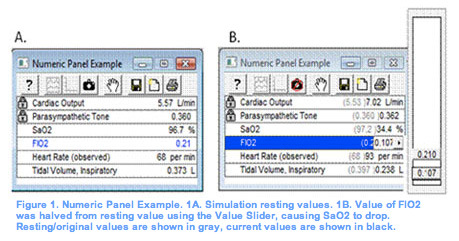 Input parameters are in shown in blue font (FIO2 in Figure 1), and simulation output values are in black. The panel on the left (A) shows simulation resting values. Input parameters values can be changed either by clicking on the blue number and typing a new value, or by using the Value Slider, as shown in Figure 1B. In this example, the FIO2 (inspired fraction of oxygen) is reduced, which will decrease the SaO2 (arterial oxygen saturation). Changes are easily viewed using the snapshot button located in the toolbar above the numeric panel, allowing the user to view the resting and changing simulation values at the same time. Clicking the snapshot button takes a ‘snapshot’ of the original values. Original values are displayed in grey, while changing/real time values are displayed in black (see Figure 1B). Some simulation parameters are ‘locked’ because they are normally controlled by the autonomic nervous system. However, Physiology Labs allows the user to turn off the autonomic control by double clicking the value. These parameters are marked by a lock symbol . 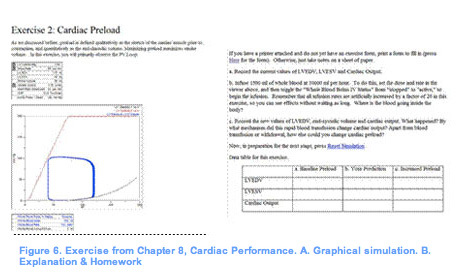 In Figure 1, Cardiac Output and Parasympathetic Tone are parameters under autonomic controls. Plotter Panels are tools to display data graphically. Five graphing options are available: Waveform, Trendplot, Curve, Loop, or Scatterplot. Waveforms can plot data as a function of time. Curves can be used to plot data that vary with changing physiology, such as dissociation curves (see Figure 2). Loop graphs can be used to plot one simulation parameter against another – for example Left Ventricular (LV) Pressure plotted against LV Volume- producing a LV Pressure-Volume loop (see Figure 5). Each graph has the same toolbar as numeric panels, allowing the user to change the view of the graph. Using several buttons on the toolbar, graphs can be viewed separately or superimposed (see Figure 2A & B), or with gridlines . A menu appears by clicking the hand tool allowing the user several options – to zoom in or out , or to show coordinate values. SimBioSys has several “Tools” that would be present in a hospital setting. The list of tools appears on the main interface (see Figure 3). After selecting a tool, it will appear and can be used in any window of the program – while viewing Textbook,Viewers, or Exercises. For example the Blood Withdrawal tool (see Figure 4F) can be used to perform a phlebotomy. The volume and rate at which blood is withdrawn can be varied using the panel’s slider control. The Catheter/Tubes (Figure 4C) tool allows the user to insert a urinary catheter or chest tube, or perform paracentesis/pericardiocentesis. The Defibrillator tool (Figure 4D) allows the user to change the charge delivered (current), the mode of defibrillation (asynchronus or synchronus), and displays an ECG Lead waveform. The Drug and Fluid Infusor (Figure 4B) tool allows administration of medication or fluids to the simulated patient. The user can vary the rate and amount given of each drug, as well as the delivery method (as a continuous IV, bolus IV, or in discrete doses). The Mechanical Ventilator (Figure 4A) can be used when the patient is in need of ventilatory assistance. The user can vary the mode of ventilation (both volume-preset and pressure-preset modes are simulated), the ventilation rate (breaths per minute), tidal volume, PEEP (positive end-expiratory pressure), and FIO2 (oxygen fraction in inspired air). A pacemaker is also available for use (Figure 4E). The user can vary the current and rate of the pacemaker, and observe the heartrate through the ECG Lead waveform graph displayed on the Pacemaker tool. SimBioSys™ has a comprehensive set of drugs that can be administered to the simulated living patient and to examine the effects on the cardiovascular and various systems. The real-time simulation feature of Physiology Labs implies that the outcome of experiments are available in real time, as they occur. Some values are calculated several times per millisecond, while others are calculated a few times per second. In addition, all simulations are synchronized. For example, if a student performs an exercise in the Respiratory chapter and decreases the oxygen fraction in inspired air (FIO2), and then goes to perform an exercise in the Cardiac Excitation chapter, the effect of the lowered FIO2 (increased heart rate) will be apparent in the following exercise. If required this can be switched off by selecting ‘Reset Physiological State’ under the ‘Simulation’ tab in the main menu. SimBioSys contains a nineteen-chapter textbook. Sixty percent of the curriculum focuses on cardiac and pulmonary physiology, while the remaining chapters cover some general physiology, kidney function, and basic CNS function. 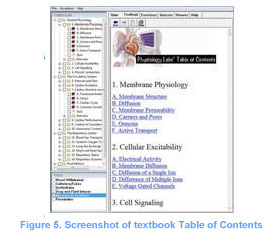 Figure 5 shows a view of the textbook interface layout. The text contains some video animations, as well as links to the lab exercises. Each chapter is followed by a quiz that can be graded. Most quiz questions are multiple-choice, although some are short answer or calculation problems. SimBioSys will grade the quiz and then give a score sheet with the correct answers. Quizzes can be retaken at any time. In addition to the laboratory exercises provided, the user can manipulate more than one hundred input parameters, and view the output in real-time. The ‘create viewer’ button on the Viewers page, allows the user can create a new viewer, such as a numeric panel or plotter panel (as described above in Set Up). In the Institutional Version of SymBioSys, the user can create their own exercise by pushing the “Create Exercise” button , which can be saved and later accessed from the table of contents. A complete list of parameters (user variable and non-variable) is available in Appendix 1. In its current state, SimBioSys could readily be used as a supplement to almost any physiology class. The program was built with the intention to teach first and second year medical students, but the basic concepts are applicable to undergrad and post-doc students as well. Because the program allows the user to create their own exercises, the parameters of the engine can be used to create exercises for students on any level. SimBioSys could be used in an undergraduate course, but many of the simulations and concepts are more specific or advanced than would generally be taught in an introductory level course. However, specific exercises could be pulled from the SimBioSys curriculum to supplement a course. Some introductory/basic concepts would need to be added to the program, as well as a bit more anatomical content (as graphics or animation) to orient the beginning learner. The seven non- cardiac/pulmonary chapters of the text (Membrane Physiology, Cellular Excitability, Cell Signaling, Muscle Contraction, Fluid Compartments, Kidneys and Filtration, and Acid-Base Physiology) would readily be acceptable for an undergaduate level, as these topics are not presented in depth. In its current state, a significant amount would need to be added to the program to make it a complete physiology curriculum. For example, the curriculum does not address tissues, the integumentary system, the skeletal system, the muscular system, the nervous system, or the digestive system. On its own, the curriculum could easily be adapted to fit a specific cardiovascular/respiratory physiology course for college or graduate level. The University of Iowa offers an undergraduate cardiovascular physiology class for which this program would be well suited. The cardiac & respiratory concepts taught in the SimBioSys curriculm could be readily adapted to fit a medical physiology course. The content includes advanced concepts, and covers most of the cardiovascular and respiratory concepts taught in a medical physiology course. As a comparison, the SimBioSys curriculum was mapped to the University of Iowa’s course, Human Organ Systems (HOS), the general physiology course taught to first year medical students. A spreadsheet on the following page shows how each chapter and exercise in the SimBioSys curriculum would fit into the HOS lectures. To better fit the cardiac/respiratory sections of the HOS course, SimBioSys should include more molecular detail, and perhaps be organized in a different format. It is important to note that in the HOS class, cardiovascular and respiratory lectures account for about one quarter of the course content. SimBioSys would require significant addition to fully supplement a physiology course at this level. SimBioSys™ development started in 1991 by a group of medical scientists, academic instructors, and computer programmers to fill a need in medical curricula in developing computerized models of the human body for use in medical education. The SimBioSys™ (Simulations of Biological Systems) programs set a new standard for interactive learning. The SimBioSys software packages are flight simulators for health professionals and students; they simulate the physiological functions of the human body, allowing practice of skills on a realistic patient. The heart of each product is the SimBioSys engine which is a real-time physiology simulator. 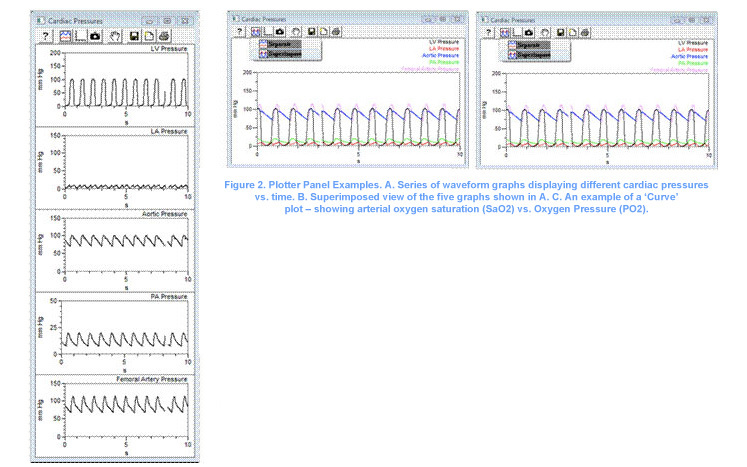 The SimBioSys engine has over 1000 physiological parameters. The underlying models include a heart, lungs, and kidneys; these are coupled to a vascular system and peripheral organs, all of which are coordinated by the central nervous system. SimBioSys models the way a real patient's physiology responds to real interactions.